If Epic Games wants Gears of War to be released on the PS3, it has the power to make it happen. One of the biggest exclusive franchises for the Xbox 360 has been Gears of War, with a third installment expected in September 2011. Contrary to what might be popular belief, Epic Games chooses to keep the popular shooter on Microsoft's console, and is not forced to do so. Speaking to IndustryGamers, Epic Games president Mike Capps said: "Do we wish we could take all those Killzone [players] and Resistance fans on PS3, and get them to say Gears is awesome'? Yeah, sure I'd love to ship the Gears trilogy on PlayStation ... I want to be there; I want to be everywhere." 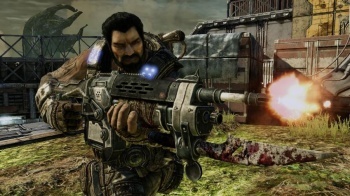 Capps confirmed that Gears of War is Epic's IP, but said that Microsoft makes an exclusive partnership very worthwhile. "Time and time again, when it came down to figure out what we do next with Gears, we sat down with Microsoft and they've given us really good, compelling reasons to work with them again," he added. When Epic Games was just, in Capps' words, the "Unreal studio," Microsoft took a chance and used Gears of War to help launch the Xbox 360. It marketed the series, helped test it, and has generally both saved and made Epic money. But is it enough money to keep Gears of War off of the PS3 forever? Capps seems to indicate a desire to share the experience with PS3 owners. Perhaps the inevitable Gears of War 4 will go multi-platform someday.